Judith Scott and Yi Zhang are teaming up to develop a high-tech dictionary that will boost vocabulary learning. Photo by J. McNulty. Dictionaries in the classroom may go the way of typewriters if researchers at the University of California, Santa Cruz, have their way. Word definitions will be just a mouse click away in new educational software being developed to help children build their vocabularies. "Students will be reading along, and when they encounter a word they don't know, they'll be able to click on the word and get the meaning right away," said project director Judith Scott, an associate professor of education at UCSC. "It's a high-tech version of a dictionary, but it will be easier to use and better, because it won't interrupt the flow of their reading." Scott and Yi Zhang, an assistant professor of computer science in the Technology and Information Management Program in the Baskin School of Engineering, are teaming up in an interdisciplinary collaboration to create a "dictionary for the 21st century." The U.S. Department of Education has provided a $1.5 million grant to fund the project, dubbed tecWAVE for Teaching with Computers: Word Annotation for Vocabulary Education. The technology will be a boon to all students, but especially to struggling readers and English language learners, according to Scott. Definitions will be tailored to different reading levels, and they will be appropriate for the context, she said, adding that pictures will also pop up, making meanings even more accessible. "A native Spanish speaker may know the Spanish word for crocodile but not recognize the English word," said Scott. "In that case, seeing the photo will really reinforce the connection between the two words." Knowledge of vocabulary is a key element in reading achievement and overall academic success, said Scott. "By fourth grade, the number of unknown words that students encounter during the school day can be extensive," she said. "Students really need support for their vocabulary learning, because by middle school, each discipline has its own specialized vocabulary." The tecWAVE software will use artificial-intelligence technologies to automatically generate definitions that will be appropriate in the context. Zhang, who specializes in the development of tools that manage large amounts of electronic information, has developed related applications for e-commerce but will build this tool from scratch. Zhang and a team of graduate students will spend the next 18 months developing the technology, followed by 18 months of field testing tecWAVE in seventh-grade classrooms in Santa Cruz and Santa Clara counties. Laptop computers outfitted with tecWAVE software will be issued to students and teachers in each classroom. Zhang looks forward to getting feedback from young users. "As a computer scientist, I can build the tool, but it's like medicine," she said. "Without clinical trials, we won't know for sure if it really helps kids learn vocabulary or not." Scott predicts that tecWAVE will be embraced by students and teachers. "It's huge to be able to bring cutting-edge technology into educational settings," said Scott. "Kids are so tech-savvy. We need to bring schools into the 21st century, and this is a big step in that direction." 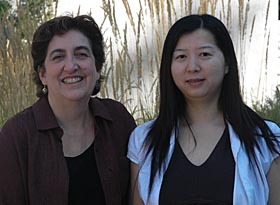 In addition to Scott and Zhang, tecWAVE partners include Kelly Stack, a faculty support specialist with UCSC's Information Technology Services Faculty Instructional Technology Center, and Jack Vevea, associate professor of psychology at UC Merced. The project is also supported by UCSC's Center for Information Technology Research in the Interest of Society (CITRIS). Note to journalists: Scott may be reached at (831) 459-5066 or jascott@ucsc.edu; Zhang may be reached at (831) 459-4549 or yiz@soe.ucsc.edu.